The Russia Investigations: 'Where's The Collusion?' This week, Paul Manafort is convicted by a jury and Michael Cohen pleads guilty. But, President Trump points out none of that has to do with the Russian attack on the 2016 election. So far. 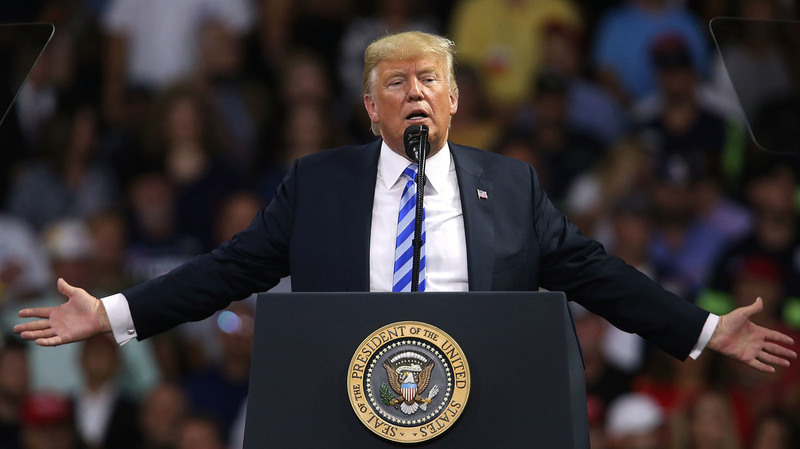 President Trump speaks at a rally Tuesday in Charleston, W.Va.
Trump posed those questions to the audience at his campaign rally in West Virginia on Tuesday — the same day his former campaign chairman, Paul Manafort, and his former longtime lawyer and fixer, Michael Cohen, wound up guilty in their respective federal cases. So the president tried to direct attention away from them — especially Cohen, who incriminated Trump as part of his guilty plea — and onto what was once the hottest thread in the Russia imbroglio. That may say a lot about the pieces of this puzzle that aren't yet assembled or even visible to the public. Based on these comments, how anxious could Trump be that investigators might discover evidence that his campaign had conspired with the Russians who attacked the 2016 presidential election? "Collusion," as discussed in past, is now in the eye of the beholder. It is a thing Republicans do not believe has taken place and which Democrats do. Trump evidently is so unconcerned about either its merits or the politics that he would rather put the spotlight onto it than the fate of two of his closest former aides. There have been indications before that people in a position to know what there is to know about "collusion" felt comfortable enough to go public with declarations that there was nothing there. House intelligence committee chairman Devin Nunes, R-Calif., staked his reputation on it. And Senate intelligence committee chairman Richard Burr, R-N.C., offered a reminder on Tuesday that one of the central planks in the collusion narrative has been debunked. 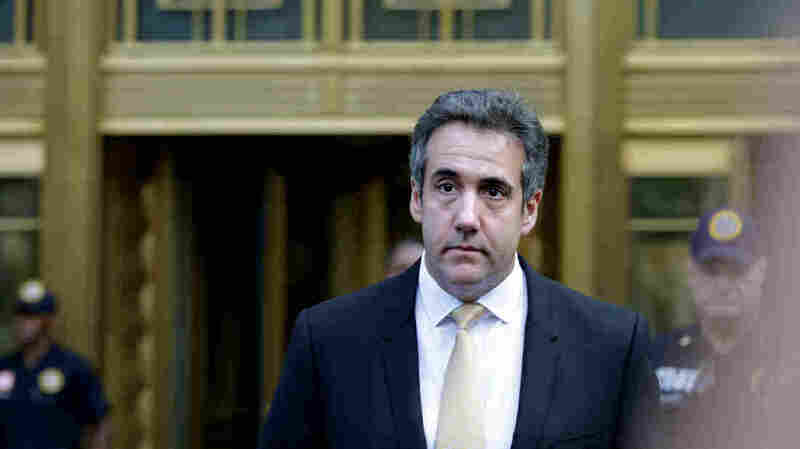 Item: The infamous Russia dossier describes Trump's then-attorney Michael Cohen playing a key role in a conspiracy with the Russians who attacked the 2016 election — a role Cohen has strenuously denied. Item: Cohen's reported offer to tell special counsel Robert Mueller that he and Trump knew beforehand about the much-discussed Trump Tower meeting between campaign leaders and the Russian delegation in June of 2016 ... and in fact, that Trump authorized it. But: Burr announced that the Senate intelligence committee has asked Cohen, following all the twists in this story and, ultimately, his guilty plea, whether he stood by his earlier testimony. Cohen's camp says he does, Burr said. Translation: These suggestions about collusion are out of evidence. Meaning what? Opponents argue there's actually a lot of evidence of "collusion" that a theoretical prosecutor might link together in a presentation to a jury. There were contacts, both personal and electronic, between Trump campaign aides and Russians throughout 2016. There was the Trump Tower meeting at which intermediaries conveyed a political tip to Donald Trump Jr. from the Russian government. There was the increase in cyberattacks — on the same day that Trump asked, "Russia, if you're listening," — for it to find Hillary Clinton's deleted emails. And so on. But so far there's no smoking gun. Not only that, in the case of Manafort's verdict, nothing implicated the president. Trump and Republicans have felt comfortable for months defending the ground on which they're standing: The Trump Tower meeting was a nothing-burger, they say, that didn't lead to a conspiracy and there was no connection between Trump campaign aides and the Russian active measures. That doesn't mean there wasn't a conspiracy. No one knows what evidence Mueller's investigators have compiled. All the same, a lot has happened in this story, including to some of the major players. Manafort has been found guilty in one federal trial and is set to begin another one next month. Neither one involves an alleged conspiracy with the Russians. Cohen, meanwhile, has surrendered to the Justice Department and implicated the president by telling the court that Trump instructed him to make the payments in 2016 intended to silence two women who've alleged they had sexual relationships with Trump — relationships which Trump has denied. Michael Cohen, former personal lawyer to President Trump, exits the federal courthouse on Tuesday in New York City. That is problematic for the president and not only in terms of the politics. It makes him an unindicted co-conspirator in the campaign-finance-related crimes Cohen has acknowledged. Not about collusion, though. The feds had Cohen at their mercy and may have collected enough evidence after their April raids on his home and office to put him away for decades. The pleas he entered involve fraud and campaign finance violations — not conspiring with Russian active measures. For every foot of this iceberg above the water, however, huge sections of it remain concealed below the surface. Manafort, now a convicted felon and confronted with the loss of his fortune, may opt to turn state's evidence in order to save himself a second federal trial next month in the District of Columbia. Who knows what he might have to offer. Cohen already is being brought in as a witness in other cases that target Trump, and he may spend much of the near future collaborating with any number of other investigations. The fates of other people in Trump world who have pleaded guilty — the junior campaign aide, George Papadopoulos; the former deputy campaign chairman, Rick Gates; the former national security adviser, Mike Flynn — also aren't yet settled. They probably will not be sentenced to prison time or face other punishments until the government has gotten all it wants. Prosecutors asked a judge on Tuesday, for example, for yet more time to continue working with Flynn before organizing his sentence. What no one on the outside can know today is how sharply this picture may come into focus or how high up the ladder prosecutors may reach. If the extent of "collusion" is the Trump Tower meeting, that's probably a good political outcome for the president. No recordings or transcripts of the meeting are known to exist. The fates of two of the Americans involved — Manafort and Trump's son-in-law Jared Kushner — are clear: Manafort is most likely going to prison but Kushner has been authorized to hold a security clearance and he continues to serve in the administration. Would that be the case if Mueller had an indictment teed up? Donald Trump Jr., on the other hand, who organized the meeting, remains an unbalanced part of the equation. Trump's political adviser Roger Stone was in contact with the Russian military intelligence officers who hacked the Democratic National Committee and other targets in 2016, according to court documents. Stone says he hasn't done anything wrong. The outlook is unclear for others, too: Attorney General Jeff Sessions, who recused himself from the Justice Department's Russia investigation because of the role he played on the campaign, is off the president's Christmas card list — which is just as well if he loses his job just in time for the holiday season. As always, there is no way to know what isn't known about this story. What is the picture on the puzzle supposed to be? This week, at least, all the admitted or alleged criminal activity seemed to point away from "collusion" and toward something more conventional: a cover-up. What's become clear is how eagerly, in the final weeks before Election Day 2016, Cohen and Trump sought to silence the women who could have embarrassed Trump.